The mattress cleaning service quickly and efficiently removes and destroys fungal spores, bacteria, dust mites and other dangerous particles with the help of a special intensity ultra-violet light. We will take out any dust and dirt with a technique which uses no moisture. Pillows and mattresses can gather millions of dust mites and dirt which are a typical reason for health conditions like itchy red eyes, eczema, dust allergies, asthma, headache, runny nose. This service is ideal for hostels, hospitals, hotels and homes. The cleaning starts with thorough hoovering and examination of your upholstery and sofa. Our professional cleaners will clean your convertible sofa, couch, settee, divan, loveseat, sectional sofa, hide-a-bed, sofa bed and more. We can remove different stains from your sofa. The cleaner pre-treats the stains with the suitable detergents. We handle paint, wine, blood, rust, coffee, tea, vomit and oily stains. The cleaner will use either steam or dry cleaning method. Upon request, deodorising can be applied to remove any unpleasant odours. We offer also additional upholstery stain protection. Our sofa and upholstery cleaners are experienced in cleaning various types of upholstery such as silk, wool, cotton, suede, viscose, leather, plush, acrylic and linen. For leather sofa cleaning, the cleaner uses a special foam, and after that a leather rejuvenator to condition the leather. It will keep it moisturised and resistant to cracking and flaking. 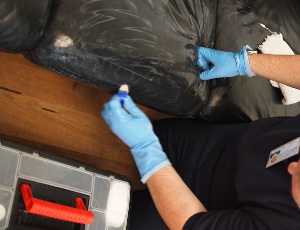 Dry cleaning is good for sofas and furniture upholstered with suede, velvet and other delicate materials. Since 2005 Excellent Carpet Cleaning has been delivering the finest sofa stain removal, dry and steam sofa cleaning for the residents and the business owners in Croydon CR. Our cleaners are skilled and equipped with the latest detergents and machines provided by the leaders in the cleaning industry. We can clean any kind of sofa for you, no matter whether it is a couch or settee, traditional sofa, sofa bed, sectional sofa, convertible sofa, loveseat, sleeper sofa, divan, hide-a-bed or other. In order to book our sofa and upholstery cleaning service, all you need to do is get in touch with our 24/7 customer care. Do that by dialling 020 3404 0500 or sending us an online booking order. You will be given written confirmation in 2 hours. Our services are insured and we don't require deposits. are included in the price. If you book one more service such as curtain cleaning, drapery cleaning or blinds cleaning together with the sofa cleaning, we will award you with an attractive discount.